The Mini-AFM is a basic AFM that provides essential AFM scanning. 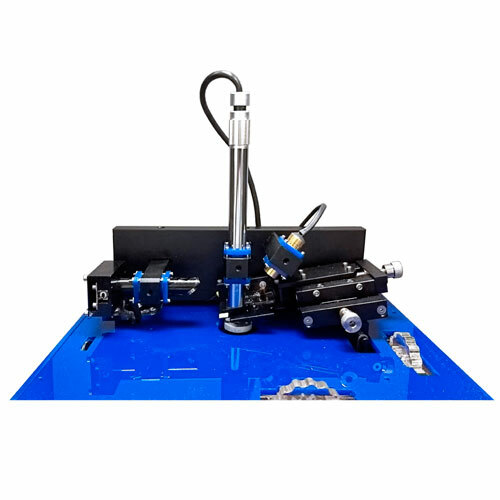 This AFM is ideal for scientists and engineers that want to visualize nanostructures on surfaces, as well as for educators that want to teach their students about AFM operation and its applications. 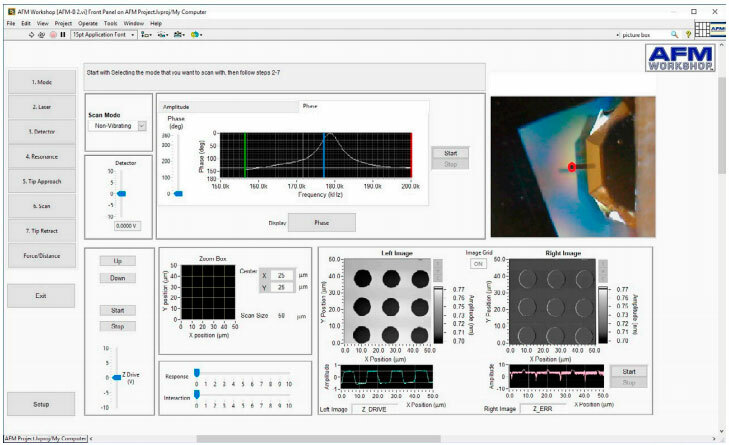 The Mini-AFM 7-Step Scanning Software is designed for casual AFM users that want to obtain AFM images without the expertise. A user-friendly design makes the Mini-AFM ideal for teaching students the basics of AFM theory and operation. A unique design of the light lever makes aligning the system a routine procedure for users with limited experience. A removable probe holder makes changing probes quick and easy. 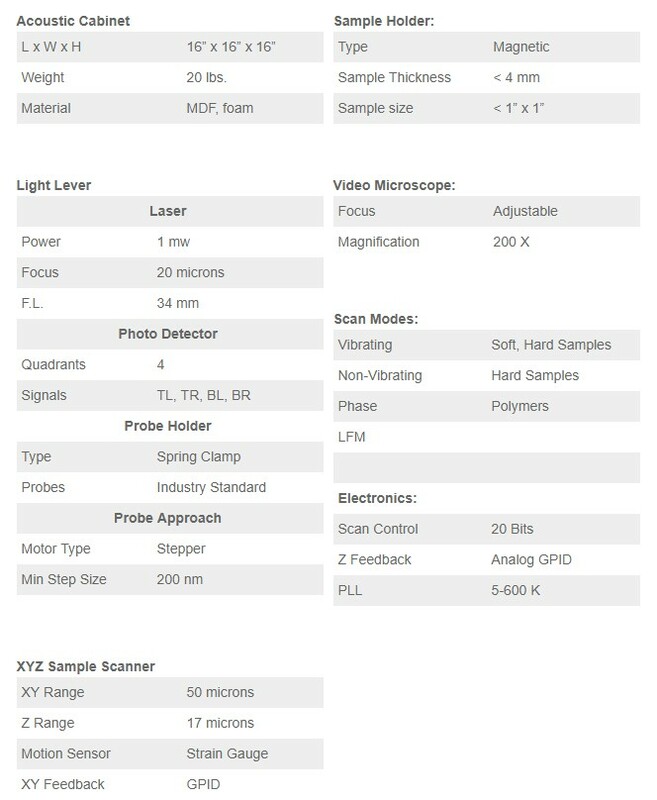 Piezoelectric X, Y (50 µm) and Z (17 µm) scanners incorporate strain gauges that provide linear scans and rapid zoom-to-feature capabilities. Scanning modes for the B-AFM include vibrating (tapping), non-vibrating (contact), phase, and LFM (Force/Distance). These modes will allow users to scan the most common types of samples. The Mini-AFM is encased in an acoustic cabinet made from ¾” MDF and acoustic foam, creating a vibration isolation environment that will provide high-quality scans on almost any lab bench. The Mini-AFM is designed for routine scanning and educational applications. With a low price point, it is ideal for scientists and engineers with bigger ideas than budgets. Routine scanning of basic samples is possible with the 7-Step Scanning Software, which is also helpful for students and first-time operators learning the mechanics of an atomic force microscope. 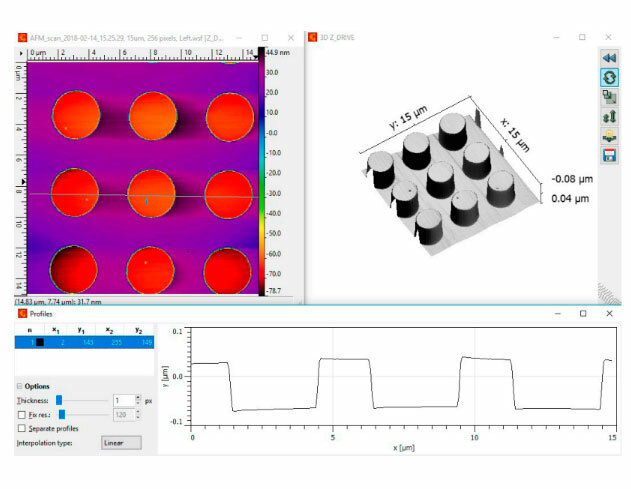 For more advanced users and complex samples, AFMWorkshop offers the AFM Control Software for the Mini-AFM. This is the same software used on all other AFMWorkshop products. Our AFMs are capable machines for the research, industry, and educational communities with applications ranging from nanotechnology to biology. The Mini-AFM is designed with an integrated stage and electronics, making it a compact and portable solution for researchers and engineers. A unique feature of the Mini-AFM light lever is that the probe is moved to a pre-established position identified with the video optical microscope, therefore removing inaccuracy when aligning the laser. With the removable probe holder, probes can be exchanged in less than a minute. A special support is provided for holding the probe holder when it is not in the light lever force sensor. Samples mounted on metal disks are held in place with a magnetic holder at the top of the piezoelectric stage. Included with the stage is a video optical microscope with 200X magnification. The video optical microscope is used for locating features on samples for scanning, aligning the light lever, and facilitating probe approach. LED lights at the bottom of the video microscope illuminate the sample. The location on a sample can be selected for scanning with the XY positioner mechanism, with a range of 6 x 6 mm. The controls for the XY positioner are located conveniently inside the acoustic enclosure on the surface of the AFM stage. Both structural and acoustic vibrations are reduced with the front opening enclosure. The enclosure is made from high-density material and is lined on the inside with noise reducing foam. Handles on the sides of the enclosure make transporting the AFM easy. The control electronics circuits in the Mini-AFM are the same as those used in over 250 AFMs by AFMWorkshop customers globally, ensuring reliability. The electronics include a high fidelity analog control loop for measuring topography and 24-bit scan DACs for driving the X and Y piezoelectric ceramics. Our unique design offers high resolution as well as a high dynamic range. The Mini-AFM software is designed for casual users that want to obtain high-quality AFM images without being AFM experts. Furthermore, the Mini-AFM is great for teaching students the basics of AFM operation and training. At the left side of the Mini-AFM Control software is a list of the 7 steps necessary for measuring an AFM image. By moving through each of the steps, an operator is able to easily obtain AFM images. When one of the steps is selected, the specific window that is required is highlighted. Instructions for each step are provided at the top of the screen. Images created with the Mini-AFM are compatible with the free image processing software Gwyddion. Gwyddion is capable of displaying images in 2D and 3D formats in a vast range of pallets. Additional analysis capabilities include line profiles and surface texture measurements. Standard with every Mini-AFM are non-vibrating (NV) mode and vibrating (V) modes for making topography scans. Additional modes included with the product are lateral force imaging as well as phase mode imaging. All of the scanning modes that can be implemented with a light lever AFM are also possible with the Mini-AFM. Vibrating mode (tapping) is the most common mode for measuring topography images with an AFM. Probe/sample forces as small as a few piconewtons are possible with vibrating mode. In Non-Vibrating mode (contact), topography images are measured with a cantilever/probe having a very low force constant. Non-vibrating mode is most often used for large area scans on hard materials. Phase Mode images, measured simultaneously with vibrating mode images, show regions of different relative hardness on a sample's surface. Phase mode is especially useful when scanning polymer samples. Using a four-quadrant detector, the torsion of the cantilever is measured during a non-vibrating mode scan. The amount of torsion depends on the friction between the probe and sample while scanning. The interaction forces between a probe and surface are measured with F/D mode. In this mode, the deflection of the cantilever is measured as the sample is moved towards the probe. Including scan rate and scan lines for higher resolution images.